I've had my Galaxy S3 for a few months now, and have always been able to connect to my PC via USB. A few days ago, it suddenly stopped working. I've found many other Android.SE threads, but none have been able to answer my question. Symptoms: when I plug the phone in via USB, the phone beeps, I get a lightning bolt on my battery, but that's it. There are no USB options in the pull-down status bar, and the PC does not recognize that a device has been plugged in. Click screenshot for full size. PC System: Windows 7 x64 with the latest drivers and Kies software from Samsung. My wife has an identical Galaxy S3--I plugged her S3 into the same cable, and it was recognized immediately. So I know the PC and cable are both working correctly. Uninstalled and reinstalled the drivers several times anyway -- alone AND with the Kies software. USB debugging mode, both on and off. Changing the UART and USB settings in the *#7284# PhoneUtil. After my last factory reset, it's set to PDA/MTP+ADB. Anything else I should try? Is there a way to determine if the USB plug on the phone is bad? Update: Try cleanup and reinstall of drivers as mentioned here. Seems to have worked for others. This seems to be a known issue, and many have had success by using a different cable, connecting to a USB 3 port etc, but clearly, those won't work in your case. Not sure what your usual usage is, but for file transfers, you can use Airdroid, which connects through wifi. I had same problem and endlessly researched and did everything except hard reset. Then, when testing the usb cable on another phone, I realized that I wasn't using the usb cable that came with my Galaxy S3 i9300. Once I plugged in the "stock" usb cable, my phone was instantly recognized. Why this is I don't know as the cable I had been using works on all other devices I tested. It even charged my Galaxy S3 i9300. Perhaps, you could be using your wife's usb cable on your phone. To avoid frustration and countless hours of testing, resetting and reinstalling I would recommend to everyone to first make sure you are using the usb cable that came with your phone instead of a generic one or one from a different model Galaxy S3. Hope it works for you! Good luck. Also experienced the same problem. In my case, discovered that the cause was from doing a backup in QPST and forgetting to revert the USB settings. i.e. 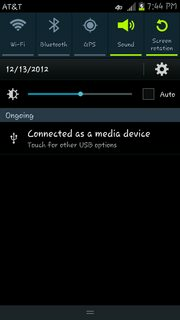 *#7284# to access PhoneUtil > "Qualcomm USB Settings" > set it to "MTP + ADB"
Download MPT (Media Transfer Protocol) Porting Kit and then install it to your computer. You can download the MPT Porting Kit installation file through the Microsoft’s official website directly. Reconnect your mobile phone to your computer by using the USB cable. after that go to usb tether mode from your mobile from settings and turn it on. then the "turn on usb storage" with a android bot standing screen will appear. tap to turn on. you have to do it twice. first time turn it on it will automatically turn off. then again tap the button and this should solve the problem. (that moment you will see another notification about tethering in the bar, don't do anything with that). Type in code *#7284# which will bring you to the phoneutil screen with PDA, Modem, and QualComm USB Setting options. Click the Qualcomm USB Driver option and select the MTP + ADB option a little message will appear @ the button of the screen saying saved, now just press the back button all the out to the normal screen. I then powered off my phone, took out the battery, sim card (tmobile) and micro sd card, put them back in, powered the phone back on and then plugged it in using the usb cable (not original that came with phone) and it started installing the usb drive and then worked. This had been bugging me for 3 months and I finally got it to work. Hope this works for everyone else as this issue was frustrating. Addon Note (from a user with a VZW Galaxy S3): This worked for me but I had to activate the hidden menu by dialing *#22745927 and changing the hidden menu option to "enable" and then entering the above code. Dial this in the keypad without calling it. It should bring up the menu after entering the last number. Not the answer you're looking for? Browse other questions tagged usb samsung-galaxy-s-3 connection-issues troubleshooting or ask your own question. My Samsung Galaxy 3 (GT-i5801) is not being detected by my PC — What should I do?